The early part of the 21st century has been marked by widespread social upheaval and geographical displacement of people and the need for refuge on a scale not previously encountered. 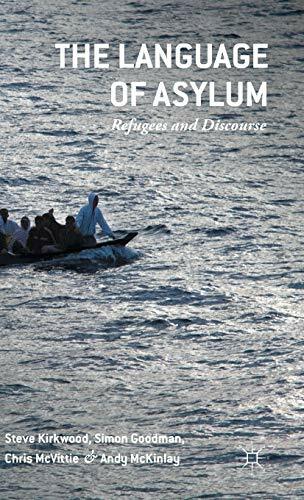 Using the case of the UK as an example, this text examines how refugees, asylum-seekers, locals and professional refugee workers make sense of asylum and refuge against this background and in the light of current asylum policies. It also discusses contemporary debates on integration, such as whether or not those seeking asylum should be entitled to work following arrival, and explores how such rights and entitlements are bound up with questions of who the refugee or asylum-seeker is and how he or she got to the UK. In these ways, the text follows the asylum-seeker's 'journey', from arrival, through the experiences of what happens to them while they are here, to the eventual outcome of their applications for leave to remain. Steve Kirkwood is a Lecturer in Social Work at the University of Edinburgh, UK. His research relates to justice and identity, including criminal justice and the experiences of asylum-seekers. He has published in several international journals, including the Journal of Refugee Studies and the British Journal of Social Psychology. Simon Goodman is a Research Fellow at Coventry University, UK, where he was previously a Senior Lecturer. His research applies discursive psychology to a range of issues including asylum seeking, prejudice and racism, the far right and income inequality. He has published widely on discourse about and by asylum-seekers. Chris McVittie is Professor of Social Psychology at Queen Margaret University, Edinburgh, UK. He has published widely on topics relating to discourse and identities and is co-author (with Andy McKinlay) of Social Psychology and Discourse (2008) and Identities in Context: Individuals and Discourse in Action (2011). Andy McKinlay is Professor of Social Psychology at the University of Edinburgh, UK. His research interests lie in the areas of identity and discourse and he is co-author (with Chris McVittie) of Social Psychology and Discourse (2008) and I dentities in Context: Individuals and Discourse in Action (2011).